Shoudio apps & sites vary from (GPS-based) audioguides to self-initiable-interviewtools to audioreporting and storytelling audiomaps. All our services can be heavily customized to specific needs. 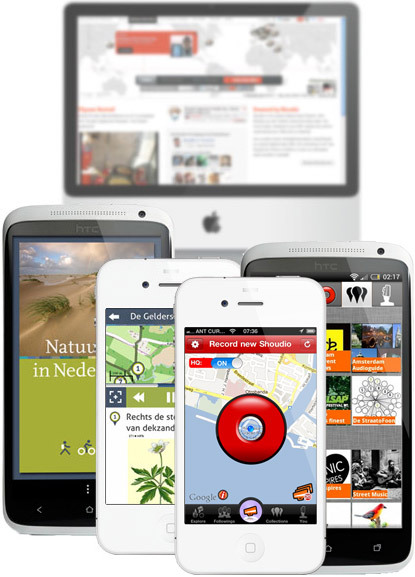 Whitelabelled Shoudio apps can be for example audioguides or audiotours including offline maps and audio content. Offline availibilty makes the Shoudio apps ideal for touristic markets (roaming) or usage in remote areas (or indoors). The apps can be further enchanced with imaginary, and additional custom tabs such as a list of interesting places, or a twitter or videofeed. The auto interviewtool can be used to interrogate people via a set of audio questions. Participants record their answers and afterwards a conversation is generated combining the questions and answers. An easy and fun way to interview a group of people or easy mass high level personal conversations about anything. Shoudio is a great tool for onsite interview purposes and audio reporting. Record audio via smartphone and instantly publish on Shoudio for homebase to download and instantly crosspost on popular social media. Our services cover the design and implementation of custom integrations for your media outlets.